Cattier Organic Soap Argimiel gently cleanses normal and combination skins without drying out. It combines soothing moisturizing Organic Lavender Honey and balancing purifying White Clay. Its vegetal formula produces a light foam which leaves skin feeling silky soft. 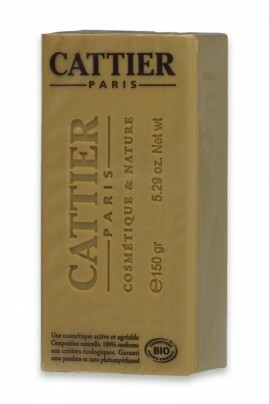 Very gentle, Cattier's Natural Soap Alargil can be used daily on face and body. J'utilise les produits Cattier depuis très longtemps. Je ne connaissais pas ce savon, il est très agréable à utiliser, la quantité est appréciable pour le prix! Seul bémol en ce qui me concerne, c'est le parfum lavande trop marqué à mon goût. En dehors de ça rien à dire , comme tous les produits de cette marque. Moisten Cattier Natural Soap Argimiel and lather onto your hands. Apply the foam on wet face and body then rinse with clear water. Can be used day and night. A gentle natural soap packed with great ingredients ! White Clay (neutral pH) : absorbant, decongestant, soothing, remineralizing, antiseptic, removes toxins, improves cell renewal.